Our main office is located at 1 Avenue Rd. in Parry Sound at the old Station Gallery train station. 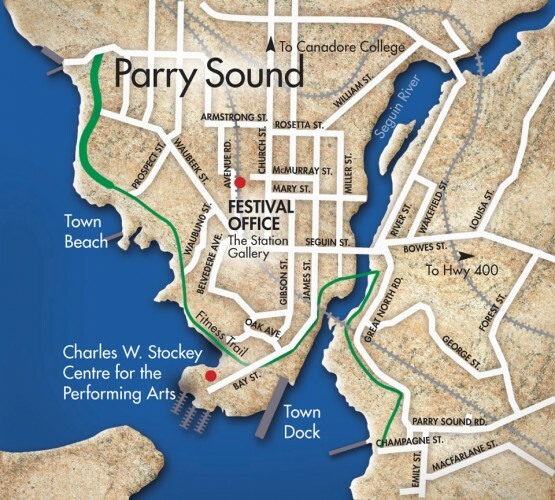 The Charles W. Stockey Centre is located at 2 Bay St.
Parry Sound is easily accessible by all major highways in Southern Ontario. There are also regular busses, trains, and water access. Follow Highway 400 North, travel approximately 1.5 hours to Honey Harbour, and 2.5 Hours to Parry Sound. Follow Highway 69 south approximately 1 hour to French River and Britt, 1.5 hours to Pointe au Baril, and 2 hours to Parry Sound. Ontario Northland offers daily arrivals and departures.